The biggest, bestest cigar retailer on the planet and the home to the venerable CI Nation. 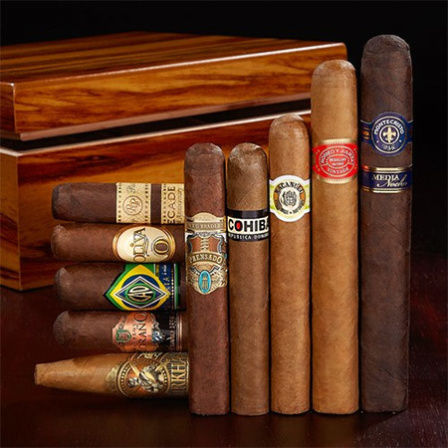 Whether you’re new to cigars, a grizzled old vet, or a certified cigar lunatic, sleep peacefully knowing you’ve found your ultimate one-stop-shop for all things cigars online. So why buy your cigars online with Cigars International? That’s simple. Cigars International is home to the nation’s largest cigar humidor. A cavernous, 49,000 square foot fortress securing over 80,000,000 tasty premium cigars, pipes, pipe tobacco, and accessories. Over 950 cigar brands stored at the optimum conditions at all times, including the brands you know, love, and enjoy regularly – Cohiba, Montecristo, Rocky Patel, ACID Cigars, 5 Vegas Cigars and much, much more. Our facility, combined with our selection, industry-leading pricing, unrivaled service, and uber-fast shipping ensure a long and fruitful relationship. In short, we just might be the best damn relationship you have.